for Qnique 14+15 21" and Brother DQLT15 Models, quilting machine needles available in either size 16 or 18. Made from high quality steel, Grace quilting machine needles work with all Q’nique quilting machine models and most long-arm quilting machines. These are made from a high quality steel and are available in either size 16 or 18. Each package comes with 10 needles. These will work with most longarm quiltng machines. 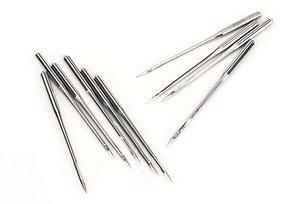 These quilting machine sewing needles are made from a high-quality steel and are available in either size 16 or 18. Each package comes with 10 needles. These will work with the Qnique 14+, Qnique 21, and most longarm quilting machines.